A MUST SEE- Kuana Torres Kahele Band Live In Concert! INDIALANTIC, Fla. - Oct. 15, 2018 - PRLog -- KUANA TORRES KAHELE BAND LIVE IN CONCERT! 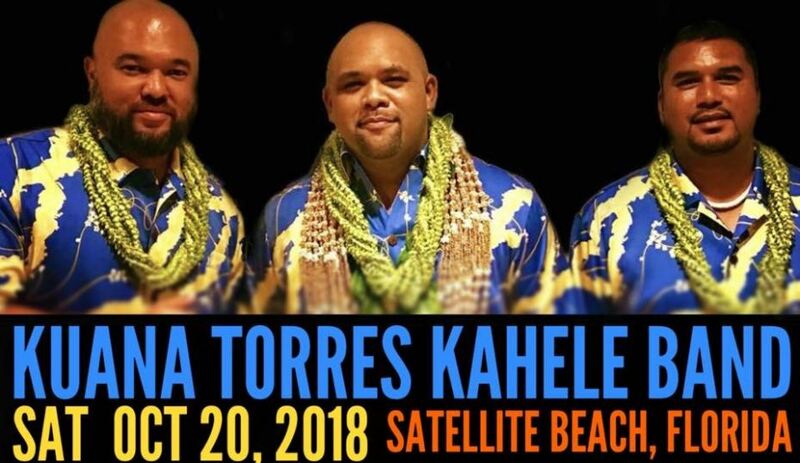 World Renowned Hawaiian Musician and Composer Kuana Torres Kahele Band will be LIVE in Concert this Saturday October 20, 2018 from 7:30pm to 9pm. Acclaimed as an innovator whose rich vocals and style expand the boundaries of Hawaiian Music, Kahele's melodies have captivated a world audience topping the Billboard Top World Albums Chart and winning him multiple Na Hoku Hanohano Awards, Hawaii's premier music awards, equivalent to the Grammy's, including Male Vocalist of the Year. His vocals set the stage for the song Lava in Disney Pixar's short animated film in 2014. Kahele voiced the lead character, the volcano Uku. Join Kuana, Ioane Burns and Glenn Mayeda for an unforgettable evening of Hawaiian Music and Hula! Tickets are available on SALE now online for $25. Click Here to Purchase! Tickets are $30 at the door. Kuana Torres Kehele is also well known as an educator, Master Lei Maker, Kumu Hula (Hula dance teacher) and regularly teaches cultural workshops. This year he has chosen Indialantic, Florida as his exclusive East Coast mainland location. This weekend, October 19-21, 2018 he will be teaching an array of Hawaiian Cultural Workshops Friday through Sunday at Holy Name Community Center including Hawaiian 'Oli (chant), Hula 'Auana (modern hula style), Hula Kahiko (ancient hula style of dance). Fresh Lei Making and Ni'ihau Shell Earrings (Hawaii's rarest and most coveted shells). Limited Spots are left! LIVE CONCERT will be held from 7:30-9pm at Holy Name of Jesus Catholic Community 3050 N Highway A1A, Indialantic, FL 32903. Located on the west side of A1A (opposite The Hilton Hotel), the parking lot entrance is the first traffic light south of Eau Gallie Blvd. Let’s Talk Dirty Laundry Announcing Grand Opening Event!